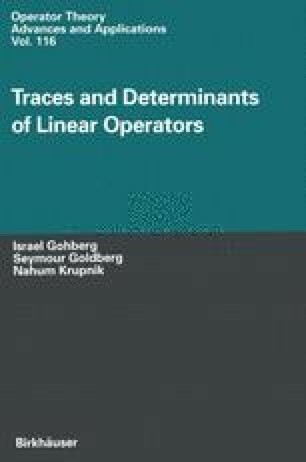 In Section 1 we treat the trace and determinant for Fredholm integral operators. For the case of a continuous kernel, this theory was first introduced by Fredholm in the famous paper [Fr]. Some modifications of the Fredholm determinant for integral operators with discontinuous kernels are proposed in Sections 2 and 3. In contrast with the regularized determinant, which are usually used for discontinuous kernels, the modified determinants considered here are multiplicative functionals and can be included in the general theory constructed in Chapter II. Additional developments of the Fredholm determinant are given which are used to further analyze Hill’s method. Section 6 contains formulas for the determinant of systems of integral operators.